All provided information supports the fact that Federal, State Laws must be followed without exception of fact. All facility policy and procedures must be followed. In the event of exception to fact, contact your direct NurseLine Healthcare Supervisor and the facility supervisor for direction. NURSELINE HEALTHCARE ("SMART-TOOLS) FOR facility staffing! Please call to day and request to speak with the System Administrator to discuss how our (Smart-Tools) can be integrated into your daily business schedule. NurseLine Healthcare would like to take this time and thank all of our clients and employee's for supporting our companies over the past (25) years! 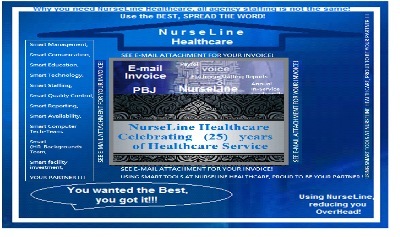 NurseLine Healthcare and its family of staff look forward to servicing our clients for the next (25) years and more! Thank you all again for all your support and to our staffing family! Thank you for visiting our Internet site. As an up-to-date Staffing Company, NurseLine Healthcare would like to extend the opportunity for you to stay in-touch with our company and Facilities we service. A new Content-Management-System (CMS) and Automated-Engineered-Computerized-Staffing-System (ACESS) will enable us to always keep you up to date. At present, our newly updated engineered web site is still under construction. We are making an effort to present you with our entire spectrum of Staffing Opportunities and Employment positions as soon as possible. At this point we can provide you with contact information regarding our Facilities serviced and upcoming programs supporting Hospital, Nursing Home, Extended Living, Hospice, Allied Health and more. In the meantime you can reach us at (WEST-COAST-MAIN: 480.717-7300), (EAST COAST-MAIN: 732.462.4400) and by fax at 732.462.4320 or E-Mail us at StaffingManager@NurseLineHealthcareinc.com. We are looking forward to hearing from you. In brief, you should know the following about us: NurseLine Healthcare was established in  and has been responsible for providing outstanding Service to over 165 facilities. Our specialty is in the area Staff-Relief placing Professionals with years of experience in Healthcare-Facilities.